Every pipe or vessel is subject to heat loss when its temperature is greater than ambient temperature. Thermal insulation reduces the rate of heat loss but does not eliminate it. Trace heating maintains the temperature above freezing by balancing heat lost with heat supplied. Normally, a thermostat is used to energise when it measures temperature falling below a set temperature value - usually between 3°C and 5°C and often referred to as the 'set point'. The thermostat will de-energise the trace heating when it measures temperature rising past another set temperature value - usually 2°C higher than the set point value. Where water storage is likely to be subject to temperatures below freezing, lagging and heating maybe required. In areas that, under normal circumstances, have ambient temperatures well above freezing then lagging and trace heating will not be required. In these instances it is the responsibility of the occupier to ensure that the ambient temperature within the building is always kept above freezing. This is particularly important if the property is left unattended for a long period of time in the winter and we would advise that the heating is left on a ‘frost' setting whilst unoccupied. These types of cables are very popular due to their inherent safety and cut to length ability. The general construction is that there are two conductors (bus-wires) providing a live and neutral supply along the length of the cable. A semi conductive heating matrix is extruded between these conductors forming the heating element. 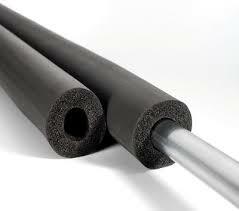 Suitable electrical insulation is further extruded over the matrix providing the dielectric barrier. The cable is then completed with options of a metallic braid and a further outer jacket for both mechanical and corrosion protection. The function of the inner conductive core is to generate heat. The output will vary dependant on its temperature and the local environment. This is the self-regulating effect. The advantage of the cable is that it cannot overheat and can be cut to the desired length. A potential disadvantage is the start-up currents which must be assessed and accounted for with any associated switch gear, thermostats or protection.